The Weihsien Internment Camp (Chinese: 潍县集中营; pinyin: Wéixiàn Jízhōngyíng; Wade–Giles: Wei2hsien4 Chi2chung1ying2) was a Japanese operated ”Civilian Assembly Center” in the former Wei County (Chinese: 潍县; pinyin: Wéixiàn; Wade–Giles: Wei2hsien4), located in the present-day city of Weifang, Shandong, China. The compound was a Japanese-run internment camp created during World War II to hold civilians of Allied countries living in North China. The camp's population initially included British, Canadian, American, Australian, Dutch, Belgian and other citizens. An additional group of Italian internees arrived in the camp on December 30, 1943, after the allied invasion of Sicily and the fall of Mussolini. In total, Weihsien remained in operation after the Japanese invasion until American forces liberated the camp on August 17, 1945. Information on Weihsien has been learned through papers, diaries, official reports and letters written by internees, family members, and other people affected. During World War II, the Allies were at war with Japan. The Japanese invaded most of the area from the Aleutian Islands in the far North to the Southern regions of New Guinea, and from Western Burma to the Mid Pacific Ocean. Japan historically invaded China on July 7, 1937, which began the second Sino-Japanese War. Overall, the Japanese held approximately 125,000 civilian prisoners or internees. Of those 125,000 civilian internees, 10% were in China and Hong Kong throughout the war. Many allied civilians, mostly Americans and British, lived in some of the Japanese-occupied areas and were forced to relocate themselves into internment camps. The Japanese called these Internment camps Civilian Assembly Centers. In these camps, death rates were high because of the lack of good sanitation, starvation, and poor treatment. There were the occasional executions and some internees suffered cruelty and torture. A group of several hundred Americans and Canadians from Japanese-controlled civilian internment camps, including Weihsien, was repatriated by civilian exchange with the Japanese to the U.S. in 1943. The categories of civilians included in the lists submitted by the Allies to the Japanese were: people imprisoned by the Japanese; people compelled to miss evacuation in the national interest; experts and technicians; missionaries; wives and families of the above categories, together with other women and children; the aged and infirm. All categories had equal priority. Yenching University professor Mary Gladys Cookingham and others from Weihsien were included in the second group of civilian internees to be repatriated; this group also included a number of civilians from Hong Kong. The group of civilians travelled on the Japanese vessel "Taia Maru" to Marmagao (Goa) in Portuguese India, where they were exchanged for a group of Japanese civilians who had traveled to Goa from the U.S. Upon arrival in Goa in October 1943, the Allied civilians expressed their thankfulness for having escaped the semi-starvation of their internment camps, as well as their anxiety for the health of those left behind in Japanese custody. The US-bound group boarded the chartered Swedish ship MS (Mercy Ship) Gripsholm and departed from Goa on October 22, 1943, and traveled via the Southern Atlantic. They arrived in New York City on December 1, 1943. The information they provided upon arrival gave urgency to negotiations with Japan for further civilian exchange agreements, but in spite of unceasing negotiation, this was the second and last group of Allied civilians to be repatriated from Japanese custody until the liberation of the Philippines in February 1945. The Weihsien camp was established in an American Presbyterian mission compound named "Courtyard of the Happy Way" (Chinese: 乐道院; pinyin: Lè dào yuàn) in Wei County, Shandong, China between Jinan and Qingdao. The compound consisted of twenty-four acres of attractive landscape. The area was 60 years old and filled with shrubbery and fine old trees. Towards the end of the war, the Japanese threatened a reprisal if this area was bombed or attacked. Barbed wire and barrier walls with electrified wires surrounded the camp. There were also guard towers that surrounded the perimeters. Every day, the internees woke up to starvation, guard dogs, prisoner badges and numbers, daily roll calls, bayonet drills, bed bugs, horrible sanitation, and flies. The climate was at times a major problem for the internees. It was nice in the spring and fall. The summer heat began in May and became extremely hot in August. There was also a rainy season that began in August, which included substantial rains. These rains, though, sometimes hurt the environment and the architecture. Occasionally, roads were flooded and walls collapsed. The architecture at this time in China did not fulfill requirements for dreadful rains, so leaking sometimes occurred in the buildings. The winters in this area were dry and cold towards December, January, and February and there was little in the way of heating the cramped quarters. The weather started to warm up in March and the summer heat was usually humid. In order to survive, the internees knew that they all had to work together. They created kitchens and a hospital, started a library, and educated their children without desks, chairs, or a classroom and with few books. Since the internment camp was in squalid conditions, people from all walks of life came together to peel potatoes, stoke the ovens, clean the latrines, and perform other repetitive and boring tasks. All of these tasks were necessary for survival, though. Latrines had to be cleaned to keep the sanitation at a good level and some internees had to peel potatoes to make dinner for hundreds of people at a time. Sometimes, the Japanese even had the internees dig graves for the dead or living. In these cases, the dead were never recorded. By the time the Japanese herded the allied civilians to the camp, the former Shadyside Hospital had been gutted and looted, and supplies had been taken. At first, the internees knew that they needed to create a hospital as their main advantage for survival. They knew that a critical part of survival was to adapt a medical center for the sick and incapacitated. Medics and volunteers set up a laboratory and hospital in just a few days using broken medical equipment. This possibly saved the lives of hundreds of internees. At one point, the doctors in the internment camp sent a list of drugs they needed to the Japanese. The doctors received only a few drugs. Later on, the Swiss got a hold of this list and brought the drugs and some food into the hospital. If internees got badly injured or terribly sick, they could be sent to an outside hospital that was very difficult to get to and expensive. At Weihsien, there were more housing units than most other Japanese internment camps. Weihsien housed approximately eighteen hundred people at a time and each person was allowed to have around four to five square feet of space. Women and men were separated on different sides of the buildings; women on one side and men on the other. The internees were placed in the basements of rooms of the hospital, school buildings, and previous Chinese dormitories. Family housing was set up in compounds, with long rows of rooms that usually held a two to four people each. The rooms were approximately nine by twelve feet and were crammed. In the course of finding suitable housing, some internees were placed into classrooms for their sleeping needs. When placed in the classrooms, the number of people could range from around ten to thirty people. These classrooms had no privacy and were extremely overcrowded. Some people had to sleep on the floors. Some lucky people were able to bring cots to sleep on. Others slept on tables, chairs, and the occasional bed. These living situations made it hard to keep warm in the winters and when the summers came, it became too hot for normal comfort. There were twenty-three toilets for eighteen hundred people and the lines became extremely long in the morning. The toilets never flushed since there was a limited water supply. Empty cans were used to flush the toilets because the cesspools were always clogged. The Japanese supplied no toilet paper, causing contamination, disease, and a bad stench. There were barely any full-sized bathrooms. There were four bathing areas that had a scarce source of water. Most of the internees used buckets to wash themselves and to keep themselves clean. One shower for the men and one shower for the women were open, each with many shower heads. Also, there was a limited amount of water in the showers. Because of this, women were allowed to shower only three times a week, though men were allowed to shower daily. For laundry, there were basins and pails in the hospital basement and some other buildings. There were three dining areas that had kitchens. At first, there were twelve refrigerators, but they were eventually taken by the Japanese for their personal use. Internees were sent meat from an army slaughterhouse; it was brought through the compound by train. This meat was unrefrigerated and many times kept uncovered. The only equipment left over or given to the internees was two large frying pans, two copper pots, some tin pails, a dozen knives and a couple of bowls. Most of the other remaining kitchen equipment was items that the internees were allowed to bring with them into the camp. Chinese farmers who lived outside the compound risked their lives to smuggle food over the walls to the prisoners. The Chinese farmers also smuggled news and messages into the camp for the internees to know what was going on outside the camp. At one point, Chinese Nationalist Party guerrillas even helped two internee men, Arthur Hummel, Jr., and Laurance Tipton, escape from the camp. These escapees lived with the guerrillas until the end of the war. On August 17, 1945, two days after the official Japanese surrender to the Allies, a small rescue team parachuted from an American B24 Bomber. The team included six Americans (Major Stanley Staiger, Ensign Jimmy Moore, Lt. Jim Hannon, Ramond Hanchulak, Sgt. Peter Orlich, Sgt. Tad Nagaki) and one Chinese interpreter ("Eddie" Wang Chenghan 王成汉). The operation, named the "Duck Mission", successfully liberated 1,400 Allied civilian prisoners. Eric Liddell, Scottish athlete, Olympic gold and bronze-medal winner (1924), rugby union international player, and missionary. Died at the compound 21 February 1945(1945-02-21) (aged 43). The film The Last Race (On Wings of Eagles- 2017) depicts Liddell's time at the camp, with Joseph Fiennes as Eric Liddell. Lope "Papa" Sarreal, Sr., The "Grand Old Man of Philippine Boxing"
Mary Previte, American Democratic Party politician who served in the New Jersey General Assembly, where she represented the 6th legislative district from 1998 to 2006. ^ a b c Previte, Mary (17 August 2005). "Mary Previte's Speech at the Sixtieth Anniversary Celebration of the Liberation of the Weihsien Concentration Camp". Weifang, Shandong Province, China: Embassy of the United States - Beijing, China. Archived from the original on August 10, 2007. Retrieved 8 March 2009. ^ a b Leck, Greg. "The Japanese Internment of Allied Civilians in China and Hong Kong, 1941-1945". Captives of Empire. Retrieved 8 April 2009. 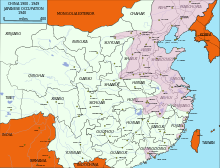 ^ "Sino-Japanese War (1937-1945) - major invasion of eastern China by Japan". Japan 101. Retrieved 8 April 2009. ^ a b c d e f g h Wagner, Ph.D, Augusta. "Light and Darkness". The Freedom of Information Times. Retrieved 7 March 2009. ^ Sutherland, J. Harry. "Weihsien Prison of War Camp". Times Not Forgotten. Archived from the original on August 17, 2011. Retrieved 8 March 2009. Sarreal was an important boxing manager in The Philippines, as well as throughout Asia. He is best known for his work, with his son-in-law Gabriel (Flash) Elorde, who held the World Super Featherweight Title between 1960 and 1967. Gilkey, Langdon (1966). Shantung Compound: The Story of Men and Women Under Pressure. Harper & Row. ISBN 0-06-063113-9. Michell, David (1997). A Boy's War. OMF Books. ISBN 978-9971972714. Tipton, Laurance (1949). Chinese Escapade. Macmillan. Kiebert-Melief, Mieke (2016). Hier in het Oosten alles wel: een Amsterdamse familie in China. Mieke Melief. ISBN 9789490085841. Leavey, Helen (2017-04-27). "Eric Liddell's former roommate in China internment camp celebrates his centenary and the time of his life". South China Morning Post. Reply All. Episode 28. "Shipped to Timbuktu". Interviews with survivors, focusing on the Girl Guides members who lived in the camp. Wikimedia Commons has media related to Weihsien Internment Camp. This page was last edited on 18 April 2019, at 06:36 (UTC).